A couple of months ago I shared how I overcame a fear. The "fear" that I overcame had to do with talking on the phone - especially in regards to calling into a radio program - and I've recently had a small victory in this area again! I know there are some people in this world who would say, "What a wimp!" :) On the one hand, I admit that this is a very strange and wimpy thing for me, considering that I spent eleven years on the radio and for three years I've been recording a weekly internet program with a friend! On the other hand, most of my on-air time was prerecorded and for the most part I was able to avoid the "pressure" of live radio. If I messed up, I could start over. Same with recording our program (we generally don't stop and start over, but I am able to edit our recording afterwards as needed). Thinking about all this, I'd have to say that my main fear of being "live" is either saying something stupid or else losing track of what I'm saying, and fumbling and mumbling while grasping to get back on track. It's so very different from writing, which I love doing. I can take as long as I desire to write and it's no big deal if I stop and start up again at a later time. But when it comes down to it, when fear is set aside I really do love communicating through speech, and I really do think that the Holy Spirit is slowly providing these opportunities for small victories in that arena. Why blog about this? I wasn't going to, but I do want to be vulnerable here and share some of these things because I do think that at least some people will relate in one way or another. And part of the overall gist of "grace roots" is the idea of a life of slow-cooking (digging our roots into Jesus and growing in Him over a period of time, rather than thinking one has to have it all together right now). I've grown a lot in my life and I have a lot of growing yet to do, and when I have a "victory" such as what I'm going to share here sometimes it's worth bringing up. I do indeed think that the Lord has really been changing my mindset in this area (from fear to faith) and as a result I've called in to live radio programs again, twice in two days! This past Saturday I called in to WHO Radio's "Saturday Morning Live" program (1040AM, Des Moines). They were having people call in with strange names of rock 'n roll bands and artists. I was enjoying listening to the program, and I knew I had a couple that I could mention, but as usual my shyness and fear kept me from picking up my phone - at first. But then I suddenly said, "what the heck," and I called. It started ringing right away and my heart started beating faster, but not as much as I thought it would. In less than a minute I was on the air, and when I was done I said to myself, "What was so hard about that? That was fun!" Then three days ago (Monday) I was listening to a program on Christian Radio called "Along the Way," hosted by Kim Jeffries. Kim was talking about a woman who is waitress at a restaurant and she has to serve alcohol to customers but she doesn't feel right about it. This woman wondered what she should do. Quit her job? Or what? It's a controversial subject, I know, so of course the types of "advice" from people ranges vastly. But as I listened, it seemed as if a lot of callers were focusing in on one thing in particular that I didn't agree with: the assumption that since this woman's conscience is telling her that she was in a bad situation, then it must be that the Holy Spirit is telling her to go find another job somewhere else. I want to say right now that I don't know how the Holy Spirit is leading this woman. But as I kept listening to the program, I kept thinking about how sometimes our consciences have been programmed by legalistic preaching and teaching, rather than by the Holy Spirit and the truth of the Word of God. I thought about what I might say if I called the show, and I knew it wouldn't be my intention to make a case either for or against drinking, but I thought it would be neat to make a point based partially upon Romans 14, that no one should judge another for the freedom or lack thereof that their conscience allows them in regards to food and drink. The point of this part of my post isn't to discuss drinking, but rather to talk about this phone call that I hesitated to make, and how the Lord is working in me at this point in my life. Again, perhaps someone can relate in one way or another. The reason I hesitated to make the phone call is because of what I've previously mentioned. Fear. What if I fumbled and mumbled while trying to make my point? The heart of what I wanted to say was clear to me, but what if it didn't come out right? And so on. But again, I really do think the Lord is doing something specific in me, and in the end this wasn't so much about making my point and speaking eloquently as it was about overcoming fears. I ended up calling, and to tell the truth I had a harder time explaining my thoughts to the call-screener than when I was actually on the air! The neat thing about this (for me) is that I was not only able to make my brief point, but I was also given an opportunity to "stay on the line" and further elaborate after a commercial break. In the end, it was quite fun and I simply rested in Christ and didn't worry about whether or not I said everything perfectly. Kim is a very gracious host, and rather than wanting to get out of the conversation as soon as I could, I was wishing I had more time! NOT that anyone really gives a rip whether or not I was on the radio, but the program is archived here (Hour 2) if you are interested in hearing it. (They have a typo - it says "January 13th Podcast," but it was the 14th). It's a 23MB mp3 file. My part starts around the 40:25 mark, although you may want to back up a bit if you want to hear more of the context and more of what the host and other callers had to say, including the story of a man's teetotalling mother who knows that Jesus turned water into wine, but who wishes He hadn't. It's, um, interesting to hear what others have to say! 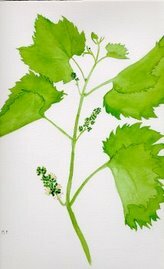 I think many of the pastors (and believers) believe (or like to believe) the vine Jesus made at Cana was 'pure grape juice' not intoxicating drink (they even have some Greek scholarship to prove this). Well, lets say their understanding is correct. How do they get around the verses in 2 Corinthians 11 where the Apostle Paul is teaching about the Lord's supper (One of the most misinterpreted passage in the Bible)? 21for as you eat, each of you goes ahead without waiting for anybody else. One remains hungry, another gets drunk. Now, who can get drunk by drinking 'pure grace juice'? Hey, this is Lord's supper at the Church of Corinth! they drink vine,the vine which can make you drunk! Apostle Paul asked Timothy to drink little vine to cure indigestion? Can 'pure grape juice' help us with indigestion? By the way, I am not promoting drinking here. But I hate it when people act 'holy' and boast that they sacrifice alcoholic drinks. Bino, yep, I'm thankful that God is doing this in my life. I'm very hopeful that one day this will be a 'non-issue' with me and that it will be "normal" for me to pick up the phone or do live radio or whatever, and not even have a thought about it being something to fear. :) The cool thing is that whenever we feel we're inadequate for something, we may not achieve victory instantly, but as God sees fit, He brings the victory. On the drinking issue, I'm not nearly as concerned with whether someone chooses to drink or not as I am concerned with how they've come to their conclusion. On the program, I did share a tiny bit about my own actual opinion on the matter, even though that's not why I called the show. I was simply trying to explain my previous blind obedience to the religious rules that I had been taught ("alcohol is evil"), and I ended up sharing how my opinion had changed through scripture and through prayer. That helped me make my overall point, that everyone is in a different place and we shouldn't judge one another, and also that some people make conscience decisions, not based upon the Holy Spirit and truth, but based upon the religious rules they've been taught. I really wish I would have had more time to talk about that. Like you, I've seen my Christian brothers and sisters "explain away" certain scriptures that don't fit into their preconceived molds (I've heard the 'grape juice' argument too). :) Again, if people have a conscience on a certain issue, let it be due to the truth of scripture and not through holding up religion and legalism over the truth of scripture. When Jesus turned the water into wine, for example, can people not see that the reason party hosts would normally serve the "good wine" first and then the "inferior wine" later is because the guests would have been too intoxicated to notice? Instead, we have people saying it was grape juice. Grape juice simply doesn't fit into this scenario. As I said, I'm not attempting to make the case either for or against drinking, but I just get ill when people intentionally put blinders on due to preconceived notions.